Blogtober Day 30: Top Ten Tuesday – Favourite Spooky Books (Halloween Freebie)! It’s Blogtober Day 30 – the final day is approaching! However I’m back again with a new Top Ten Tuesday! TTT has actually moved from The Broke and the Bookish now and is actually over at That Artsy Reader Girl so go and check out everyone’s posts over there! This week’s TTT is a Halloween freebie – I’m so sad spooky month is nearly over, it’s one of my favourite months of the year! Today I’ve decided to recommend some of my favourite books for the spooky month, so let’s get to it! . This horror filled Young Adult book has been at the top of my Halloween Book list since the first time I read it a couple years ago. It combines childhood innocence, with the purest form of horror – the place you feel the safest actually being the one place that is out to get you. Blogtober Day 23: Top Ten Tuesday – Favourite Villains! It’s Blogtober Day 23 and I’m back again with a new Top Ten Tuesday! TTT has actually moved from The Broke and the Bookish now and is actually over at That Artsy Reader Girl so go and check out everyone’s posts over there! This week’s TTT is all about one of my favourite topics – VILLAINS! I absolutely love a good villain, and sometimes they’re my favourite parts of books. It was very hard to talk about just 10 of my favourite villains, but I think I got most of my favourites down! Let’s go! I mean this book is literally entirely about villains so how could I not mention it? Victor is such an amazing character and the definition of a lovable villain for definite! Blogtober Day 9: Top Ten Tuesday – Longest Books I’ve Read! It’s Blogtober Day 9 and I’m back again with a new Top Ten Tuesday! TTT has actually moved from The Broke and the Bookish now and is actually over at That Artsy Reader Girl so go and check out everyone’s posts over there! This week’s TTT is all about the biggest books we’ve read! It took a while to work out which big books I’d read, and not all of these are probably the longest I’ve ever read because I have the worst memory – but here we go!!! Blogtober Day 2: Top Ten Tuesday – Authors I Want to Meet! It’s Blogtober Day 2 and I’m back again with a new Top Ten Tuesday! TTT has actually moved from The Broke and the Bookish now and is actually over at That Artsy Reader Girl so go and check out everyone’s posts over there! This week’s TTT is all about the author we wish we could meet! There’s so many and it was so hard to choose just ten but one day I really want to meet everyone on here! Let’s go! I would absolutely LOVE to meet Jay – his books are absolutely amazing, and I’d love to spend time sat chatting about why he kills all my favourite characters and how he makes his books SO good! I mean is anyone surprised? I adore Sarah’s writing, and if I ever got to meet her and tell her how much I love her books, it would be such an honour! Cassandra Clare’s books helped me through the start of my depression and I would love to meet her and thank her for writing those books that helped me and made me feel less alone. Kim was the first author who ever took a chance on me to review their book, and I would still love to meet her! She is wonderful, and means so much to me, it would be an honour! Twilight was one of the first series I ever loved, and I still love it to this day – so naturally I’d love to meet the author! Do I even need to explain why? Markus’s writing blows me away and I adore everything he does, so meeting him and getting my copy of The Book Thief signed would be everything! Matt’s books quite literally changed my life. They saved me, and I would love to let Matt know that, that he helped me when I thought it was impossible. It would mean so much to me. I mean, who wouldn’t want to meet the King of Horror???? She’s an actual queen and it would be so amazing to spend time with her, and discuss all her amazing books! Also we seem to have similar humour so it would be so much fun! Dawn seems like an absolute treasure to meet, and it would be so amazing to get my books signed by her, and have a laugh along the way! There we go – that’s my top 10 authors I’d love to meet! Hopefully one day I can cross everyone on this list off!! Who is on your TTT? Anyone from mine? Let me know below! Top Ten Tuesday: Books By My Favourite Authors I Haven’t Read Yet! I’m back again with a new Top Ten Tuesday! ! TTT has actually moved from The Broke and the Bookish now and is actually over at That Artsy Reader Girl so go and check out everyone’s posts over there! This week’s TTT is all about the books by our favourite authors that we haven’t read yet! I can’t believe it’s taking me so long to get to these – why am I like this?? I love Sarah’s books, and I have no idea why I haven’t read this yet other than the fact I am still SHOOK after reading Behind Her Eyes! Top Ten Tuesday: Fall TBR! This week’s TTT is all about out Fall TBR’S! There are SO many books I want to read before the end of the year, but I’ve tried my best to narrow it down to just 10! These ten are my most highly anticipated releases, and also the books that have been out for a while that I’m annoyed I still haven’t got to! Let’s go! I mean how could this book not be on here let’s be honest? Am I ready for this series to end? NOT ONE BIT. Am I going to read the book probably in one day when it’s released? YOU BET’CHA. Top Ten Tuesday: Hidden Gems! This week’s TTT is all about books that we have found that are hidden gems! It might be ones that people don’t talk about anymore, or books that you never hear anyone talk about, now is the time to talk about them! I just finished the final book in this trilogy, The Towering Sky, and honestly if you hear someone screaming it’s probably me about how much I ADORE this series. The minute I put it down I was so upset more people weren’t talking about it because it deserves all the love in the world! It’s so brilliantly written, with so many essential and well developed characters – I don’t know how Katharine does it. Please please PLEASE read this series! 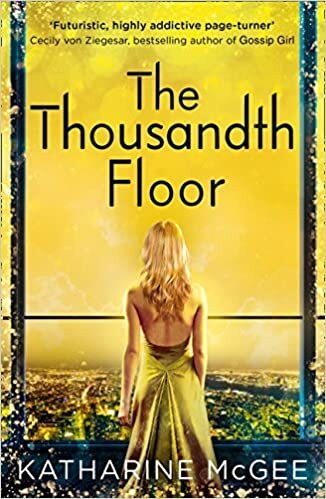 My review for book one is here: The Thousandth Floor by Katharine McGee // Review. Top Ten Tuesday: Favourite Bookish Websites/Blogs! This week’s TTT is all about our favourite bookish websites and blogs! I really love this idea, and I’m ready to share some love – especially for some of my favourite bloggers! There are SO many other bloggers I didn’t fit into this post though! Let’s get into it! I love Epic Reads so much – I love their listicles of the best books during the month, and also I think the design and everything else is just so fun and a wonderful bookish place to go! Top Ten Tuesday – Popular Books That Lived Up To The Hype! This week’s TTT is all about popular books! We all know that popular books can have a tendency to be over-hyped, but there are some books out there that deserve the hype they get – and these are some of my favourites! This book is absolutely wonderful. It was all I heard about in the months running up to it’s release earlier this year, and after reading it let me tell you it is so very worth it. The writing is everything and I adored it! Top Ten Tuesday – Best Books I’ve Read in 2018 So Far! This week’s TTT is all about the best books we’ve read so far in 2018 – let me tell you there is a LOT! I’ve read 89 books so far this year, so let’s try and choose 10 of my favourites! I absolutely adored this trilogy and I honestly am so angry at myself for not reading it earlier! I powered through it at the start of the year and fell in love with Laini! My reviews are here: Daughter of Smoke and Bone by Laini Taylor // Review, Days of Blood and Starlight by Laini Taylor // Review, Dreams of Gods and Monsters by Laini Taylor // Review.